McDermott: "I'm still going through it." Head coach Sean McDermott has yet to make his decision on who will start behind center for the Bills' home opener on Sunday. ORCHARD PARK, N.Y. - Head coach Sean McDermott has yet to make his decision on who will start behind center for the Bills' home opener on Sunday. In response to that disappointing 47-3 loss to the Baltimore Ravens, McDermott did not say whether Nathan Peterman nor rookie QB Josh Allen would get the start. 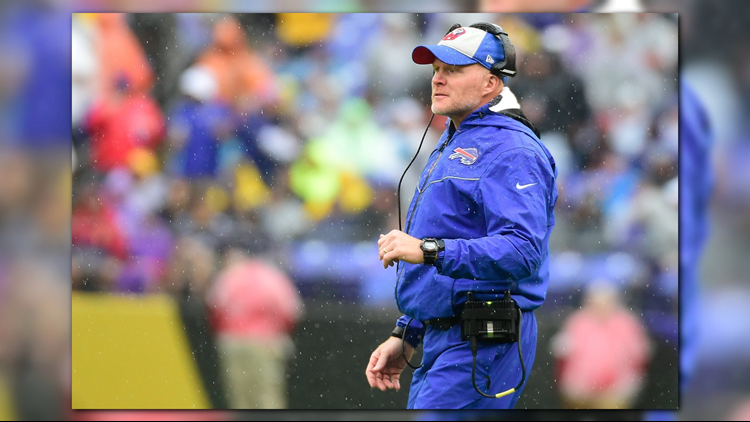 "As far as the quarterback position goes, I know you guys will be asking about that shortly," McDermott told reporters at New Era Field Monday afternoon. "I'm still going through it and trying to respect where everyone's coming on it. I'm going to continue to evaluate where we are. We all have to our job better, whether it's the quarterback position, or my position just to name two of them, but you can go around." Peterman finished the day 5 of 18 with 24 total yards and a 27.8% quarterback rating before Allen replaced him in the 3rd quarter.